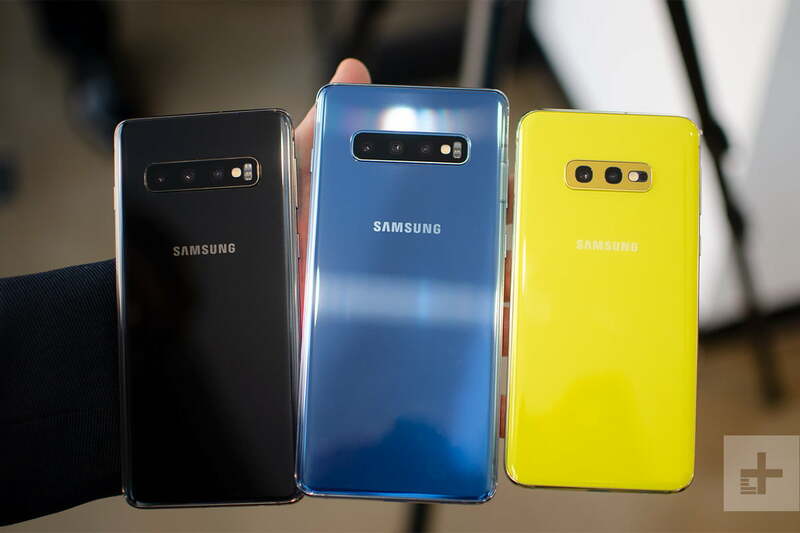 Like Apple did with its 10th-anniversary iPhone, Samsung is celebrating 10 years of Galaxy smartphones with a new device debuting alongside the highly anticipated Galaxy S10 and S10 Plus — the Galaxy S10e. But while the iPhone X was the flagship, staying a rung above the iPhone 8 and 8 Plus, the S10e is the cheapest phone of Samsung’s 2019 flagship lineup. And if you thought three phones was a lot, think again. There’s also the Galaxy S10 5G, which supports the next generation of mobile networking technology. It’s not available yet. The S10 and S10 Plus bring a few improvements over last year’s Galaxy S9 and S9 Plus, so let’s break down what these phones — including the S10e — are all about. The Galaxy S10, S10 Plus, and S10e may be packing the latest generation of smartphone processing power, but they’re just as fragile on the outside as glass-clad phones have proven to be. At least, that’s the conclusion SquareTrade has come to, having put each new member of Samsung’s flagship range to the test. The tests were simple: A drop onto the front of the device, followed by a drop onto the back. You can see the testing and the results in the video above, but what’s interesting is which phones came off best. None of the devices got away damage-free, and all three suffered varying degrees of damage and shattered glass from both falls. The S10e seemed to come off worst, as the screen not only shattered, but became nonfunctional after a single drop. The back drop saw the camera lenses shatter and the flash stop working too. The S10 Plus fared better, functioning perfectly after both drops. However, both front and back drops caused shatters with dangerously loose glass shards. The standard S10 performed the best, staying fully functional despite similar shattering, but with no dangerous glass shards. These results put the phones in a similar league to the Galaxy S9 and iPhone XS range, though there’s no word on how many devices were tested. After all, results on these tests can vary across single devices, and we wouldn’t be happy to put money on the S10 being the “strongest” of the range. Still, there’s no doubt these valuable phones benefit from protection, and that’s why we’ve put together case round-ups for the Galaxy S10, Galaxy S10 Plus, and the Galaxy S10e. The Samsung Galaxy S10 is already being hailed as arguably the best phone out there, but it could get even better. 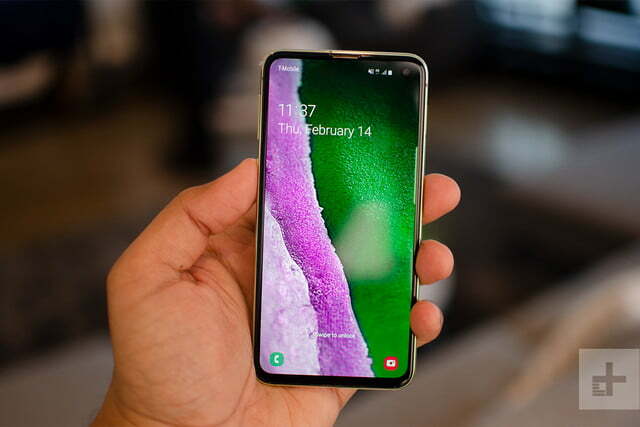 Carriers have confirmed that the Galaxy S10 will have a software update available to it as soon as it’s launched, which will reportedly improve the camera and the in-display ultrasonic fingerprint sensor. The update will also bring the February 1 security patch to the Galaxy S10. So far Verizon and T-Mobile have confirmed the update — though it’s likely other carriers will push it, too. In other words, if you’re a Galaxy S10 early adopter, expect a software update to be ready for you as soon as you set it up. 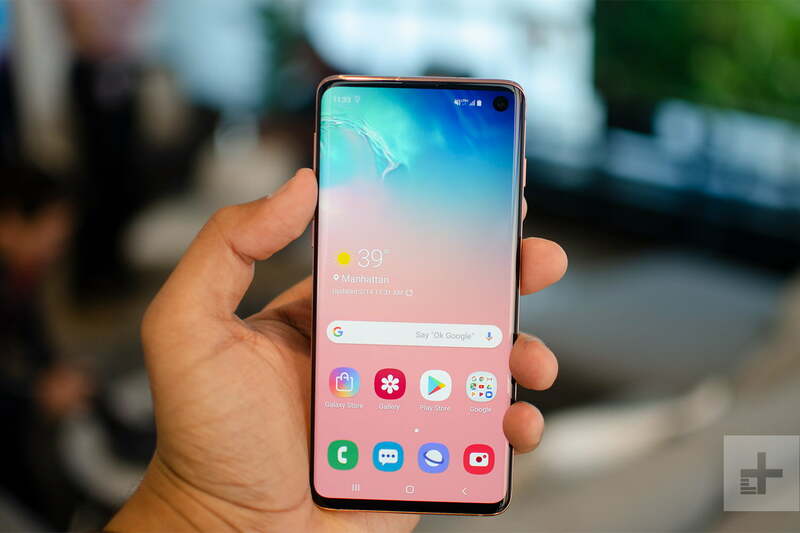 Samsung’s new Dynamic AMOLED display on the Galaxy S10, S10 Plus, and S10 e has been awarded DisplayMate’s highest-ever score, with particular praise being heaped on the display’s color accuracy and picture quality. This is becoming something of a tradition for Samsung now. 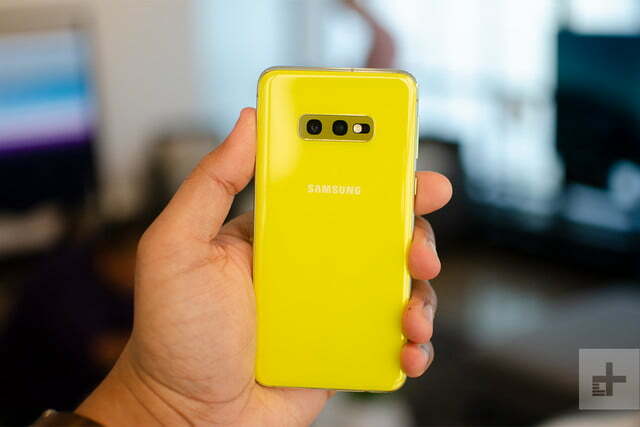 The Galaxy S9 and Galaxy Note 9 set new records on DisplayMate’s tests when they were first released, and like the S10, they were praised for their exceptionally strong picture quality and color accuracy. This test confirms that Samsung really has pulled out even more stops for its Infinity-O displays. 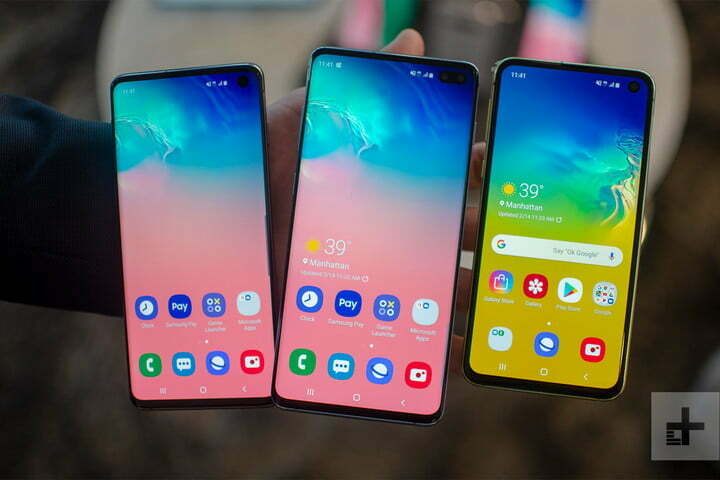 Also of note in the review is the observation that the S10’s display can reach 1,215 nits and is 17 percent brighter than the S9, and that the display either equals or exceeds over a dozen previous records for smartphone display performance. In short, the Samsung Galaxy S10 range contains the absolute best smartphone display you can get right now. 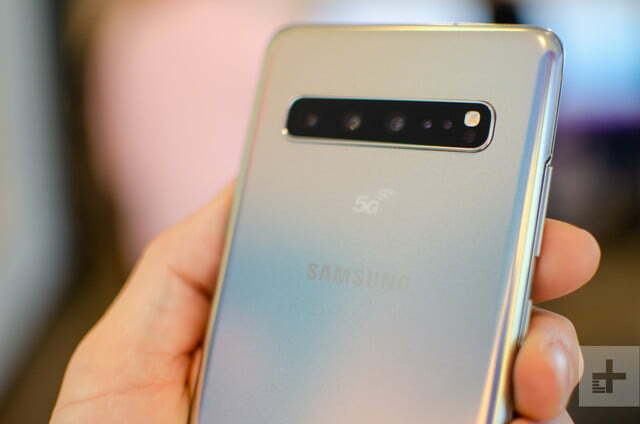 There are quite a few visible differences between last year’s Galaxy S9 series and the Galaxy S10 series, notably on the back as the phones mimic the horizontal camera setup that’s present on the Galaxy Note 9. The back design is cleaner than usual because there’s no fingerprint sensor. Instead the S10 and S10 Plus have an ultrasonic fingerprint scanner on the front under the display like the OnePlus 6T, but the technology is different. Samsung said the in-display fingerprint has better anti-spoofing measures as it scans the 3D contours of thumbs and fingerprints instead of just capturing an image; machine learning algorithms are applied to keep it secure. The fingerprint data is stored in the phone’s Knox TrustZone, so it’s never uploaded to the cloud. What’s neat is the in-display fingerprint sensor is secure enough to be used to unlock sensitive apps like the one from your bank, and can even be used to authenticate payments via Samsung Pay. It also has a FIDO (Fast Identity Online) Alliance Biometric Component certification, which is a relatively new standard that ensures biometric tools pass certain tests and are indeed secure. The fingerprint sensor under the glass is new, and so is the screen technology, which Samsung calls the Dynamic AMOLED display. Not only is it the first HDR10+-certified screen, which means it offers crisper details and more accurate colors, but it also reduces blue light exposure by 42 percent. Blue light at night can disrupt sleep, which in turn can affect your health, and Samsung’s new screens are TÜV Rheinland-certified to reduce exposure. The screens are Samsung’s Infinity-O display type, which means there’s a hole-punch camera at the top where the selfie camera sits. A laser-cutting process cuts out a small hole from the screen without damaging pixels, which allows the phone to have skimpier bezels around. The end result is an impressive screen-to-body ratio of 93.1 percent, giving you more screen real estate than ever before. The Galaxy S10 has a 6.1-inch screen whereas the S10 Plus opts for a 6.4-inch one. Both have a 19:9 aspect ratio, with a Wide Quad HD+ resolution. The hole-punch camera — which we first saw on the Honor View 20 — fits just one camera on the S10 but two on the S10 Plus. The main lens is a 10-megapixel camera with an f/1.9 aperture, with the capability to shoot 4K UHD video. The S10 Plus’ second lens packs 8-megapixels with an f/2.2 aperture, but it’s used only to capture additional depth data for better blur or bokeh effects with selfies. It’s the rear camera setup that’s a little more interesting. There’s now a third camera joining the party, and it’s an ultra wide-angle, 16-megapixel lens with an f/2.2 aperture. It’s joined by the standard 12-megapixel lens with an f/1.5 to f/2.4 variable aperture (which we first saw on last year’s Galaxy S9), as well as a 12-megapixel telephoto lens with an f/2.4 aperture. The latter two lens feature optical image stabilization. 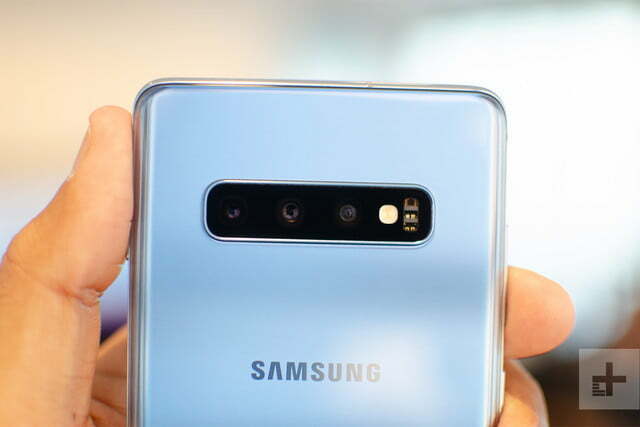 Both the S10 and S10 Plus have the same rear camera setup, which is a stark difference from previous offerings as Samsung’s Plus-sized phones always had the extra camera as an additional purchase incentive. The third camera offers a 123-degree field of view, and it makes the Galaxy S10 and S10 Plus more versatile cameras. We’ve seen these three types of camera lenses on phones before already though, as Huawei has done it on the Mate 20 Pro, and LG did the same on the V40 ThinQ. This ultrawide sensor can be used for features like the new Ultra Wide Panorama feature, and those panoramas can be taken both horizontally and vertically. Scene Optimizer is back — it uses artificial intelligence to enhance photos based on what an algorithm thinks is correct, and now Samsung has added support for 10 more scenes including babies, dogs, cats, shoes, and more, bringing the total to 30 supported scenes. One new camera feature is called Shot Suggestions, which is when the camera app offers suggestions such as straightening the camera so the photograph isn’t tilted. If you’re an Instagram user, the Galaxy S10 might be for you too — the device will come with an Instagram mode built right into it, essentially meaning you can shoot photos and upload them directly to your Instagram stories. You’ll get access to stickers, editing tools from Instagram, text, hashtags, and so on. As for video capture, Samsung said the new S10 range supports super-steady video capture, and they can film in HDR10+ at 4K as well. The Galaxy S10 and S10 Plus are powered by Qualcomm’s Snapdragon 855 processor in the U.S., with 8GB of RAM and 128GB of storage for the base models. The S10 only offers 8GB of RAM for the 512GB variant, but the S10 Plus has a 12GB RAM option for the 1TB storage option. There are MicroSD card slots in case you need more space, and you still won’t need to get rid of your 3.5mm earbuds because the phones still have headphone jacks. The S10 has a 3,400mAh battery, but the S10 Plus ratchets it up to a large 4,100mAh capacity, which beats out the battery on the Galaxy Note 9. A USB-C port charges it back up, but Samsung strangely still only supports Qualcomm’s Quick Charge 2.0 technology, so your phone won’t charge as fast as many other Android phones today. There’s Fast Wireless Charging 2.0 support, so wireless charging should be the same speed as wired, which again is a little behind the times. Speaking of the battery, Samsung is taking out a page from Huawei’s book with a new feature called Wireless PowerShare. It lets you juice up any Qi-enabled product by simply placing it on top of the back of the phone. So you can charge an iPhone XS back up with the S10 series, or even Samsung’s new Galaxy Buds, which come with a case that supports wireless charging. The Galaxy S10 Plus does differ from the rest of the range because it has a vapor chamber cooling system designed to keep the phone cool for a longer period of time as you perform graphics-intensive tasks, like playing Fortnite. It should mean the phone offers slightly better performance. All the phones are also optimized for the Unity engine, which many games are built on, and Samsung said that should improve frame rates and latency — games should run better, in layman’s terms. There are stereo speakers and they’re tuned by AKG with support for Dolby Atmos. As usual, the devices are also IP68 rated for water resistance, so you can take them underwater for 30 minutes up to 1.5 meters. Finally, the Galaxy S10 range are among the first phones to support the new Wi-Fi 6 standard. It delivers a better transition from LTE to Wi-Fi, a more secure connection, 4 times faster access, and it’s just 20 percent faster than the previous Wi-Fi generation. There aren’t a lot of routers that support the new standard just yet, but it further future-proofs the phone. The phones run Android 9 Pie, the latest version of Android, with Samsung’s One UI interface layered on top. There aren’t a ton of new software features, but Samsung said the phones offer faster app launch times as it learns your habits and preloads apps when it expects you’re about to use them. So if you regularly open Flipboard in the morning, it will prepare the app ahead of time so it launches quicker. Bixby — yes, the virtual assistant still exists (with its own dedicated hardware button) — now has a new feature called Bixby Routines. There are three modes in Routines: Driving Mode, Work Mode, and Night mode; set up the apps you want to use in these modes and Bixby will ensure they are easily accessible and ready to go when these modes are triggered. The base model starts with 6GB RAM and 128GB of storage, but an 8GB and 256GB option is also available. Many of the other specifications are the same, including the Snapdragon 855 processor, though the battery size is smaller at 3,100mAh. There’s also no in-display fingerprint sensor — instead, it’s a capacitive sensor on the right edge of the phone, which is similar to older Sony Xperia smartphones. The S10e doesn’t have the telephoto lens you’ll find on the S10 and S10 Plus either. Rather, it keeps the new ultra wide-angle lens the other two have, pairing it with the same 12-megapixel standard lens. All three phones come in Prism Black, Prism Blue, Flamingo Pink, Prism White, and Prism Green color options, but only the pink, black, blue, and white options are available in the U.S. The Galaxy S10e is the cheapest, starting at $750 for the base 128GB model. Next is the Galaxy S10, which costs $900 for the same amount of storage; and the price goes up to $1,000 for the Galaxy S10 Plus. To commemorate the 10-year anniversary, the 512GB and 1TB Galaxy S10 Plus models will come with a ceramic backplate. Ceramic offers better scratch resistance and durability than glass, though Samsung is hardly the first to use the material in a smartphone. The 5G version of the Galaxy S10 will arrive in the second quarter of the year as an exclusive on Verizon, but will be sold through Sprint, AT&T, and T-Mobile later on in the same time period.